You barely have to think about this dish. 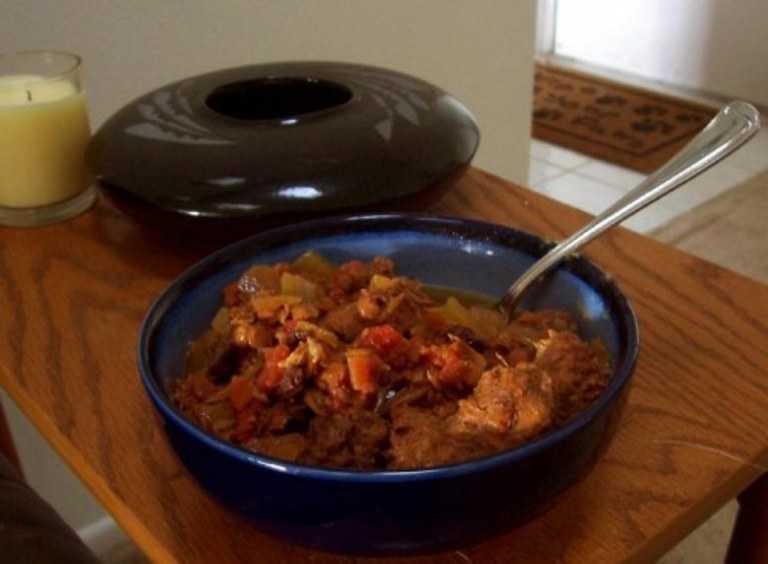 All you do is throw everything into your slow cooker in the morning, set it to low, and go to work. When you get home, it'll be ready to go. Alternately, you can simmer it in a dutch oven or throw it in a low oven in a casserole dish, but who has time for that? A note on the habanero: This is powerful juju, and it bites back. Fire-eaters should mince it finely. If you're no Trogdor the Burninator, just cut it in half and discard the seeds and white ribs before adding the orange flesh. If you can't take the heat, just substitute a little hot sauce or cayenne pepper -- or you can leave it out altogether. You know, if you're a wussy. Before service, pick out the cloves, the bay leaves, and (if you opted out of the circus-freak version) the big pieces of habanero. Serve the stew over mashed plantains or sweet potatoes. If you add a little brown sugar and milk to these, it'll help combat the burn of the stew.